'Climate to Severe Weather Linkage' Falls Flat – No US tornadoes reported in March | Watts Up With That? March 19, 2015 in Climate News, extreme weather. But, but,,but cyclone Pam was the 3rd strongest cyclone in the southern hemisphere. with reliable quantitative records beginning when…???? Big fan, but I just don’t think these posts are useful. Worse, they can turn on you. Weatherbell is forecasting a 45 day period of extreme weather that will have the warmest howling with glee. Why give them the opportunity to remind you of this post, which is just what they’ll do if that forecast pans out. Weatherbell is forecasting a 45 day period of extreme weather that will have the warmest howling with glee. So how does that work again? They’ll be freezing their balls off and howling with glee about global warming. Yes, I know it’s now called ‘climate change’ and ‘climate disruption’. But we know and they know and they know that we know it’s all about warming. Do the CAGW people look at themselves in the mirror each morning and see Bozo the clown? Extreme weather derived from what? Hmmm, ah, yes, I remember – extreme weather derived from two decades of static temperatures. Errr, run that past me one more time? Yes, static temperatures produce ever increasing extreme weather. And 97% of scientist believe this, so it must be true. And 97% of politicians believe IsIam is a religion of peace……. because it will make the US witch hunters, from high and low places, look like chicken little. Is this Packy before he grew the beard? Actually the 5th strongest since 1989! On the south Pacific and extreme weather I find this during some warm times. It’s worse than we thought! And Cyclone Pam was devastating because of where it hit. Here’s a link to the Us Red Cross if anyone wants to help (and hasn’t already). A strong hurricane is a climate. Also record highs. Record lows are weather. Record snow fall is weather. This must be alarming to the alarmists. Bastardi’s Saturday Summary said he expects higher than average tornadoes starting in mid April through May based on Gulf of Mexico temps and comparing analogs. NOAA, based on TNI, says a light tornado season. Joe has been fairly certain that the cycles of the 1930s are being repeated. This is more coherent in my view than the claims of unprecedented phenomena. I’m always there on Saturdays to learn. Umm. Is March done where you live? Here in Michigan we are only 20 days into March, so it must be one of those Day light Saving Time things. I agree. As I write this, it is March 23, with 8 days still to go. 8 days in which it is possible to have tornadoes. I think I’m missing something. Is there a forecast for the U.S for the next 8 days in which the forecasters do not see tornadoes in their crystal ball? I agree. As I write this, it is March 23, with 8 days still to go. 8 days in which it is possible to have tornadoes. I think I’m missing something. Is there a forecast for the U.S for the next 8 days in which the forecasters do not see tornadoes in their crystal ball. The headline and sub head refer to all of March but the actual content says “That’s right, so far this month there have been no tornadoes reported in the U.S.”. So the headline and subhead are a bit premature, but the text qualifies it as “to this point”. It would be nice if the headline matched the content. It’s been interesting in NC, where we often have a few starting in March. Tornadoes happen when cold fronts overrun warm air (correct me if I’m wrong, Anthony). They usually happen here when we have warm wet weather and a cold front rolls down over the top of it, creating unstable air with a rolling twist to it, or when we have the right pattern of thunderstorm along a particular kind of front. But this year we were cold, cold, cold and then just have been “normal, normal, normal” (I can’t really call it warm — it is perfectly seasonal weather). No real cold fronts. No hot fronts. No storms at all. If it weren’t for the fact that warming is completely absent, this would indeed be a sign of global warming, because the simple physics of storms is that they arise largely from thermal and humidity contrasts — warm and cold air right next to each other creating the instability leading to the violent, turbulent, latent-energy-releasing storm. A warmer world would have less thermal/humidity contrast, hence fewer storms. But this year we can’t even use that excuse. It will be interesting to see how far back the year pushes the record. If we’re back to the 1950’s already, chances are good that each additional day is pushing the record still further. Since we are continuing to extend the all time record for days without a major Atlantic hurricane making landfall in the US (in spite of attempts to promote cat 1 Sandy to major and pushing e.g. Arthur to a 2 when it was really a 1 everywhere but at one wind gauge for around 1 minute at one station) things simply do not look good for the assertion that AGW leads to more violent and expensive storms. Quite probably the opposite. But suppose the opposite is true. Suppose a slightly warmer world has fewer storms, and the expected losses from storms is actually dropping by a hundred million dollars and two human lives a year (in constant dollars, accounting for increased coastal building and so on). Will anyone add that to the cash value of the 15% more food we are growing at 400 ppm compared to under 300 ppm, or the value of the lives that are fed by that food? Will anyone add to that the cash value of the 15% more timber being grown in the same amount of time? Will anyone add that to the value of the lives saved because fewer people die of the flu and other illnesses in warmer winters (not that we are seeing them, but suppose)? 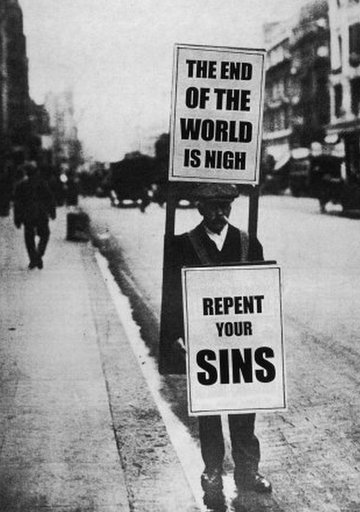 It is by no means clear that the “climate” of Earth was optimal in 1800, or 1900, or 2000. I would say that an objective analysis of the economics indicates that it is much more likely to be optimal in 2000 compared to 1800 or even 1900, if “optimal” means optimal for the overall biosphere or human affairs either one. And there is the rub. “Optimal” is relative to a given subject of interest. It is not even clear whether the relative optimality of 2000 vs 1900 is due to environmental changes or adaptive changes by humans. A good deal of the improved productivity is human action (increased land area under cultivation, improved – or at least optimized – crop lineages., etc.). We’ve had an interesting start to spring here in East Texas, and it’s quite welcome after the droughts of recent years. Winter was colder than usual here as well, but wet – a lot more snow and ice then we usually get. Then it finally warmed up about 3 weeks ago, and after that there has been rain. And more rain. Not big storms, no big winds, nothing violent – just rain. We’ve had 10 inches here in the last 3 weeks when normal would be about 2, and its raining again today, and tomorrow, and the next day. All of the lakes in the area are already overflowing their spillways. It’s like all of California’s missing rain decided to show up over here. But most of it seems to be coming up from Mexico, so its warm and gentle. I recall reading somewhere that El Nino years are good, wet years for Texas. Whatever the cause, it’s a lot better than drought! Glad to hear it wws! It’s axiomatic that droughts are followed by rains. …And the wheel goes ’round and ’round. This is precisely what climate scientists such as Reid Bryson were saying 40 years ago. And saying it as if it was more or less obvious, Climatology 101 stuff. Not just on earth. A colder world is a stormier world, not just in frequency of storms but power. Please see Mars, Jupiter, Saturn, Uranus and Neptune. The driver of storms is the differential between the equator and the poles, hence the colder, which means lower T toward the poles, the more frequent and powerful the storms. The climatic history of earth shows this fact, as well as of her sister planets. CAGW has not a leg upon which to stand. Not even a big toe. 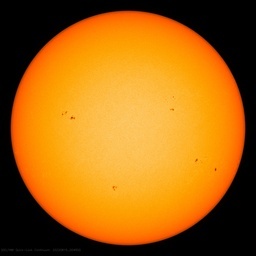 It will be even bigger after it’s reported using a zoom lens…. By the way, Robert, Superstorm Sandy wasn’t even a Category 1 at landfall, if you are measuring wind speeds over land. I trawled all over the NWS readings at the time and didn’t find sustained winds over land anywhere close to 74mph. But Sandy did cover quite an impressive area. things simply do not look good for the assertion that AGW leads to more violent and expensive storms. I think I hear Holdren’s head exploding. Add another name to the witch list. Naw, that noise is what the left makes when it doubles down on the lies. Not a single tornado in the U.S. is actually unusual for any month, including December when the country averages about 20, let alone the first half of March when there should have been about 25 thus far this month. You could almost say, unprecedented. Anything other than the normal amount of tornadoes, at the normal strength will be indication of human activity. What’s normal? Anything other than the current conditions, of course. Anyone else impressed by the scale of the trends in that graph? If the formation of hurricanes were completely independent from year to year, that graph would not likely exhibit as many multi-year trends as it does. Instead it appears a bit like a random walk. It suggests that the conditions responsible for the formation of these storms evolve very slowly and over the course of many years. At the far left, there is the bump in 1973, check. There is a double bump heading into 1980, then a comparatively flat stretch on both of them until about 1985 when a curious thing happens. Hurricane intensity remains constant or even drops a hair up to 1990, but global temperature supposedly rises by around 0.1 C over that stretch. Hurricane intensity then rises sharply up to around 1993-1994, dips, then rises again to 1996-1997 where global temperature remains almost flat with a couple of peaks but each followed by a dip. The 1997-1998 super ENSO that supposedly warmed the entire planet by between 0.2 and 0.3 C all by itself corresponds to a sharp dip in intensity, followed by a rebound while again, global temperatures remain nearly flat. Then — most interesting of all — hurricane intensity drops all the way back to 1970’s-1980’s levels and remains flat for a full decade. A trusting person would say “Wow, this is just proof that the hypothesis is incorrect, tropical cyclone intensity has no useful correlation with global average temperature”, but this makes little physical sense. Even the dip associated with the ENSO in 1997-1998 makes sense from the global temperature perspective — that event released a lot of heat from the oceans, cooling them, hence the drop in cyclone intensity. However it is impossible to reconcile this with HadCRUT4, because any sort of linear model could not possibly have dropped back to 1970-1980 levels with the planet’s surface area — well over half of which is tropical and suptropical ocean supposedly 0.5 C warmer (or more). The first half of the curve already contradicts this, showing a remarkable sensitivity to average temperature, and there appears to be at least some correspondence in the pattern of warming/cooling events throughout, it is just the amplitudes and average trend that are all wrong. The question here is: Which one do you trust more? The comparatively simple thermodynamics governing hurricanes that empirically works pretty well at predicting hurricane intensities as a proxy for the temperature of the oceans driving the hurricanes, or the small mountain of adjustments and fiddling that is done to the HadCRUT4 temperature record (almost all of which seem to produce more warming, strangely enough). The funny thing is this. If it weren’t for the HadCRUT4, and GISSTEMP, and BEST, and so on, if we had to guess global average temperature by looking at correspondences in weather patterns, would we be concluding that warming had occurred at all? from the 1970’s to the present? The winters of the late 60’s and 70’s were much like the last two winters. The hurricane intensities seem to reflect much the same thing. Tornado frequencies too. Arctic ice is low, to be sure, but Antarctic ice is at an all time high and we are learning that Arctic ice is complex and may not be the best proxy for an average global temperature, where hurricane intensity IMO should be an excellent proxy for average global temperature. In fact, the IPCC agrees with me here — they predict more, more violent hurricanes that is supposed to be driven by global warming, because they SHOULD be a really excellent proxy. The problem is, if they are, the proxy is telling us, as clearly as it is possible to tell, that HadCRUT4, GISSTEMP, and the rest are almost certainly substantially biased warm and that the true warming over the last 65 years is probably much less than the 0.5 to 0.6 C these heavily adjusted anomaly models are asserting. Today’s just not my day for closing tags. Mod? Help again please? The secret is to type the closing tag immediately after the opening tag, then put the content in between. “A cynical person — and I am nothing if not cynical about this — would note that if one subtracts a linear trend from HadCRUT4 roughly equal to the entire temperature increase from the mid-1970’s to the present, the two curves would be in excellent correspondence. So it is equally possible to say “Wow, this is just proof that […]“. Perhaps there is another possible and more plausible explanation: The temperature is reacting to two factors, one of which (call it “A”) causes the long term trend, and the other (“B”) causes the fluctuations. Factor “B” also influences storminess. Thus the storms are not caused by temperature, but both are influenced by some other factor, “B”, which we don’t understand yet and which obviously isn’t represented in the climate models. And BTW, factor “A” isn’t understood or represented in the climate models either. It’s no surprise that the cyclone count over the last 40 years is nearly constant. Variations in natural and anthropogenic heat effects are very small, you can say almost zero, in the equatorial zone. The swings originate from oscillations in the oceans. I don’t see how they can claim that the super ENSO warmed the planet. Without more energy coming from the sun, all that can happen is that an ENSO moves heat around a bit. It warms the atmosphere but cools the ocean. No? The BBC reporter who arrived on an island off Vanuatu seemed suprised that the palm thatched buildings had blown down. Perhaps he didn’t realise that it’s easier to rebuild an house like that than build one that’s cyclone proof. A house that’s cyclone proof in that part of the world would pretty much have to be a concrete bunker, and who wants to live in that? They build them in the Caribbean – sprayed concrete on steel frames and wire. Supposed to be hurricane resistant to abt 100 mph. I suppose the usual thing happens when a bigger wolf comes by. When I was in the Philippines, after the big cyclone there, they said they could not afford concrete. Which is true – most people own the clothes they wear, a mobile phone, and not much else besides. So I suggested buying 5mm steel cable and using it as guy-ropes – up and over the huts. It would only take 20m of cable per hut to strap it down. Galvanised 5mm glider cable runs out at about $0.30 per meter, so $6 would stop a hut from blowing away. And prevent all the dangerous debris too, which blows other huts away. So they ordered a batch of cable reels. Hope it makes a difference. No, no, no, you just don’t understand. Tornados, when they come, will be much stronger than usual because of climate change. Just you wait and see. I just checked my climate alarmist manual, and it hasn’t been wrong, eva. Time to trot out “Extreme calm” and “Severely moderate” weather descriptions. In Oregon the fire seasons are always worse than average. Either we had more rain than usual which creates more combustible materials, or less rain than usual which means drier combustible materials. and there’s a fire caused by “lightning” on the Warm Springs Reservation absolutely every year so the tribes can muster up for the Federally Funded fire fight. The “spin”-meisters will no doubt tell us: the tornadoes are hiding in the deep ocean. Where did you think Sharknadoes come from? It’s only March 19. 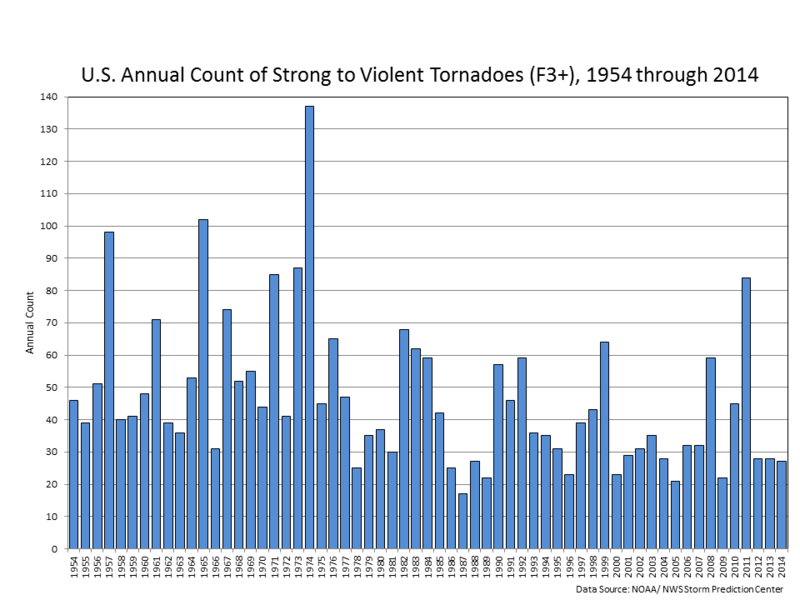 We could still have the worst tornado season in history for all we know. This is entirely from the recent weather pattern………..a cold northern stream dominating with chilly, dry and stable air masses. No serious intrusions of very warm humid air very far north, into the Plains/Midwest. This is almost always the case when Winter cold hangs on and Spring warmth is delayed. Don’t read a thing into it. The tornado season is just being delayed. How will things shape up when we do get into tornado season? I have no idea. It looks pretty quiet for another 10 days and it depends on factors that we don’t have much skill in forecasting beyond a couple of weeks. 1. We need warm, humid Gulf air to spread northward. An upper level ridge in the East would assist but we’ve had a trough there recently. 2. We need a powerful jet stream to be aimed in the direction of the warm humid air. 3. A contrasting air mass, either much drier or preferably much colder along with the jet stream would ignite some tornado generating severe storms. Global warming that increases temperatures at higher latitudes the most, generally speaking, decreases severe storm and violent tornado numbers because the meridional temperature contrast is less and this provides less energy for mid latitude cyclones and extreme weather events like tornadoes. However, generally speaking does not apply to individual seasons, where tornadoes can occur at the extreme ends of the wide range. In 2011, for instance, we saw an exceptionally high amount of deadly tornadoes. Since then, it has been exceptionally quiet. Note the 1950’s-70’s and the numerous deadly tornado outbreaks. Global cooling increases violent tornadoes………generally speaking and global warming decreases them overall. We have also decreased the death toll with much more efficient detection and warnings. Not all tornadoes are created equal. Something like 90% of tornadoes are the weaker type and cause very few deaths. It’s still not a good idea to ignore a tornado warning for weak tornadoes(you can never be sure). On the other hand, less than 5% of tornadoes, which are the most violent cause most of the deaths. When you hear or read that phrase, be alert and be ready to head below ground if a warning is issued. “from 1945-1969 when the globe was undergoing a weak cooling trend, the Atlantic basin experienced 80 major (Cat 3-4-5) hurricanes and 201 major hurricane days. By contrast, in a similar 25-year period from 1970-1994 when the globe was undergoing a general warming trend, there were only 38 major hurricanes (48% as many) and 63 major hurricane days (31% as many) (Figure 15)“. There is an interesting post about Experiments that CO2 and other GHGs have no Greenhouse effect. An interesting read, what I found interesting was the assertions about the balancing effect the entire system down through the crust and possibly in to the core. This one fact would explain the “cold sun paradox” which gives me some pause to actual consider it. He doesn’t have to say there is no link just “We have found no link to date”. That would be fine and true. Sharknadoes though, are a different story. Final tornado numbers are out for 2014 now. You would be better of consulting the Farmer’s Almanac – they have a much better track record of predicting the weather than the climate models. I see it now. Weird Climate. Rats, it is already patented. best wishes to those who were hit by Cyclone Pam & are now picking up the pieces. People living on a remote island in the north-west of Vanuatu are having to drink harmful saltwater following last week’s cyclone, the BBC has discovered. I’m hearing reports of people drinking seawater. They seem ti ignore that our islands are largely porous limestone. The rain leeches down into the stone and exits at the shore. It is not only common, it’s actually very safe to dig into the beach and tap these springs for drinking water. I know, because I have one such spring outside my house. Please people, try not to propagate this kind of ignorant alarmism. Things are not great here. They are very hard. But jumping to the worst conclusions doesn’t help anyone. Locals in Vanuatu have rejected a report from the BBC that some people have resorted to drinking harmful saltwater as they wait for relief supplies. The report claimed people in Moso, off the north-west coast of Efate, had been drinking saltwater for two days. Samuel Wor Wor is a community leader on the island of Ambrym and is currently in Port Vila.He says it’s far more likely people are sourcing water from natural springs at the shoreline, which are common in the Vanuatu island chain. Journalist Bruce Hill, Pacific Beat (Radio Australia) was on ABC Media Report today stating BBC’s report on “drinking salt water” was WRONG, & the result of “parachute” journalists arriving after a disaster, without any knowledge of local customs. Don’t they know how to boil it and collect the condensate? boiled journalist may be tasty, but the condensate is rubbish. Because fresh water is less dense than salt water recharge from rainfall forms a fresh water lens on top of the salt water. Locals would have access to these “springs” or dug out sources that intersect the fresh low salinity watertable. The drinking of salt water just seems to be MSM hype. AGW theory is laughable because their basic assumptions as to how the atmosphere would behave due to global warming in the first place have not turned out. They then cover themselves by trying to say their theory (which it did not!) predicted a more meridional jet stream pattern would evolve in response to global warming and this in turn would lead to more severe weather. This is in direct opposition to what their theory said originally which was a more zonal atmospheric circulation and less extremes in weather. This report goes against model predictions, so clearly the observations must be wrong. The Left never let facts stand in the way of a desired story. Tornados are weather, not climate. Their individual occurrence or absence proves neither a warmist or alarmist theory. A trend may demonstrate some link. However credibility of both groups is undermined by trying to link warming or the lack of it to their incidence. Now, how far down that rabbit hole must one go to prove their credibility ? Stupid question, I’ll bet there are models for that. Climate is just the weather over a long period, which includes all the extremes/ranges in weather elements that occur and the frequency of that occurrence. Part of the climate of “Tornado Alley” in the Southern Plains of the US, includes violent tornadoes that occur with a higher frequency than any other place on the planet. If global warming contributes to less tornadoes in Tornado Alley, for sound meteorological reasons and this has actually been observed in the last 30 years, then why would this not be significant? Same thing with keeping track of hurricanes and droughts. Even if they are rare occurrences, like the severe drought of 2012(first widespread drought in 24 growing seasons in the US Midwest-a new record for best growing conditions ever for that #1 world grain producing area) or there are no major hurricanes(cat 3 or higher) to hit the US in almost a decade, these extreme events that DO happen are important in defining the climate where they DO hit. When these extreme weather events go down like they have over the past 30 years, in a world that claims they are going up, it is significant. Not just significant regardless of who is saying what about it, but especially significant to correct the false, widely politicized information designed to convince our world that extreme weather is increasing. think of the Children, when they grow up they won’t even know what a Tornado looks like. gasps, waves hands in air, gestures wildly….. The goddess Pam predicts stormy weather the likes of which has not been seen. Why? Because this wee little redheaded Leprechaun lass is pushing 59 and is having hot flashes that would melt diamonds!!!! Don’t laugh funny boy! My prediction, based on a model, is likely to occur! With high confidence! Was that a threat ? Ahhhhh – The Missing Heat. Hang in there, Kiddoo! I had some ‘thermal instabilities’ a year or so back m’self. Finally traced it to a cantankerous thyroid that needed rejiggerin with suitable synthetic endocrine supplements. Thankfully, I’m once again dependent on the wood stove for intermittent hot flashes. I’ll disagree with Joe Bastardi’s active spring tornado forecast. We’re still in an El Niño base state which tends to reduce tornado counts vs. normal. Notice on the chart posted by Mike above that the spikes in the 2000s occurred during La Niña years instead. Sure they may be severe weather and tornadoes from mid-April onward, but the overall count should remain below- not above- normal. Time will reveal the grand experiment….. There is a tendency for more tornadoes In La Nina years like 2011 and 1974 and less in El Nino years(just like there is more global cooling in La Nina years and more warming in El Nino years), so I agree with the idea but exceptions to that are great enough, so that in any one season, this can be completely swamped by other factors. Must check out Piers Corbyn’s predictions, he’s often spot on. We are seeing a big drop in the number of tornados. Does anyone know if this is worldwide? Climate models predict the moon to be tornado free. IPCC recommends similar solution for earth. This article is incorrect. There had been an increase in tornadoes they are hiding in the ocean at depth called Kelvinnados. I have it. Global Weirding will cause MORE TORNADOES. less often. Definitely. MORE TORNADOES. less often. Lack of extreme weather is extreme weather. Just received the latest National Geographic which we have been subscribing to for thirty years or thereabouts but this one is looking like the final. The editorial is aghast ‘50% of Americans do not believe in climate change!! !’ And they are lumping these people in with anti-evolutionists, anti fluoride, anti vaccination groups etc. A good way to alienate their readership if ever there was one. Why don’t people realise that weather events are no different on average it is just that many more people are now living in areas that were sensibly unpopulated – flood plains and low lying coastal areas. Severe weather events have always happened somewhere. If no one was there to record is it assumed that none occurred? Here is a recent WUWT thread on that hideous National Geographic hit piece. Everyone basically agrees with you: the article was a superb way to alienate what’s left of NG readership. Looks like Winter in the South continued right through March, rather than really ending in February as is the norm. However, the last week has started show the the first signs of change. Tornadoes are now reported in several places in the US – and it is March still so the heading of this post is now incorrect!